Barry Pelphrey, Senior Pastor of New Beginnings Outreach Ministries in Piketon, Ohio describes his spiritual journey, a testimony of brokenness, transformation, and a spiritual growth in “Pure Gold: Tried by Fire,” the companion volume to “Walking through Hale,” Angie Pelphrey’s story. Successive years of draught without rain forced Barry into filing bankruptcy and downsizing his once successful outdoor and power equipment company. The added concern for his wife Angie, who was now fighting addiction to prescription pain medications relating to her fibromyalgia and a work related injury, along with the responsibility of caring for three children while pastoring a growing church was draining Barry physically, emotionally, and spiritually. The crushing blow came when Angie was charged with a felony and incarcerated. Barry tells his story of how through brokenness he was transformed into the person God intended him to be. Devotional thoughts from his sermons during this period and thoughts he shared with Angie in personal letters during the ten months of her detention reflect God’s working in rebuilding Barry’s life. These devotional thoughts, messages, and personal observations are inspirational, challenging, and motivating and well-articulated. “Pure Gold” is written to show how God can take someone religiously insecure through the midst of their brokenness, rebuild, and radically transform them through a relationship with Jesus, give them peace, and increase their ministry. “18-Wheeler Jihad” is a fast paced Christian Suspense novel that takes the reader from a small Midwestern town, to Iran, North Korea, Venezuela, and Central America. Will and Patricia Scott are in the middle of a terrorist plot of unbelievable proportions that test their faith and ingenuity as they try to make sense of the intelligence information they have assembled. Novelist Ken Bontrager, recognized for linking Bible Prophecy to current events, writes with convincing authority on a broad base of issues. From; the determination of radical Islamist terrorists, Muslim rituals, dogma, the Koran, and the message of Christianity Bontrager details background on the South American drug cartel, hi tech weaponry, submarine operations, Middle East languages, and aquatic life as background material to his story line. Ken shows amazing insight into human nature through his character development, and dialog. He reveals their motivation, strengths and weakness. His portrayal of evil is characterizes in the threat of unprincipled terrorism. His Christian characters reveal the reality of humanness as well as that of being partakers of the character of Jesus as they offer acceptance, forgiveness and genuine love as they describe the simplicity of the Gospel message. “18-Wheeler Jihad” is well written fiction with a message, informative, and instructional filled with suspense intrigue and action. Louise Morse encourages the reader to discover the Holy Spirit’s capacity for unlocking the confused mind of victims of dementia through times of worship. “Worshipping with Dementia” is made up of a rich selection of devotional mediations, scriptures, prayers, songs, and familiar hymns. The introductory chapters include words of encouragement for the care-giver as well as important suggestions for using the various elements of worship, personal visits, and gift of touch to bring a good feeling to your loved one, “even if the person can’t remember why they feel good.” Beautiful illustrations, examples, and reminders of how the Holy Spirit is ministering, communicating, and comforting in ways we can’t see fill the pages of these chapters. The chapters that follow are made up of devotional chapters which include a theme, a selected scripture, and short lesson or narrative with an uplifting inspiration message. A thoughtful prayer and the words of a well-chosen hymn complement the thematic nature of the meditation. The selected themes include thoughts on contentment, friendship, God’s provision, his purpose, and the precious gift of salvation. A favorite of many will be the familiar premise “The Lord is My Shepherd” from the 23rd Psalm. This meditation includes a hymn from the Scottish Psalter dating back to the year 1650. I appreciate the simplicity of the format, directness of each element of the narrative, and the care in selecting the prayers and hymns chosen to open a fleeting moment of “break through” for the person with dementia. Contributors to the book have all experienced, first hand, the benefits and blessing of worshipping with these “pilgrims and saints” at various stages of their journey through the “shadow lands” of dementia. “Worshipping with Dementia” is a unique compilation of inspirational meditations, scriptures, prayers, and hymns. Louise Morse’s writing continues to bring cutting edge insights into the care of an ever increasing number of those afflicted with dementia. This new work is another important resource for caregivers, pastors, and medical professionals. This is the first person account of Jim Comer. The narrative details the role reversal he experienced as he became the primary caregiver for his aging parents. The book is divided into four sections. In part one Jim records the emotional and practical challenges he faced when his father suffered a massive stroke and his mother was diagnosed with Alzheimer’s. Jim reveals an uncanny sense of humor as he relates incidents from his eight years of dealing with the unexpected twists of care giving as he guides the reader through valuable tips, heartwarming stories, and valuable insights into life in retirement homes, assisted-living facilities, and nursing homes. The next moment I’d find my eyes welling up with tears as I empathized with Jim as he watched his mother as she came out of the anesthetic after hip surgery, deeply disoriented and agitated. Each chapter in this section ends with “Comer’s Commandments”. These are brief summary statements of the lessons Jim learned from the incidents related in the chapter. These are excellent points to discuss with siblings, or to assimilate yourself for future application as you prepare for your possible future role as caregiver. Part two includes interviews with experts in five areas of elder care. The questions and answers in this section lay the groundwork for interaction and a proactive strategy for planning for facilities, health care, elder law, long-term insurance, and funeral planning. These experts in their individual fields provide solid advice and steps to research locally the available choices the readers will find themselves making. Part three in made up of fifty questions that will save you time, money, and tears. This is a tear out section and should be considered an important first step in determining the primary care giver within the family and the desires of the parents prior to a crisis. Section four provides resources for getting the help you need at federal, state and local levels. The author’s goal in writing this book was “to help the reader make informed decisions, avoid disasters, and recover quickly from the occasional error in judgment.” Comer has done this using his uncanny wit, his heartwarming understanding of human need, and his gifted talent for writing. This is a book every reader will refer to often. Jim Conner is an outstanding communicator with an important message. This is a book that will help you experience personal growth, and move you into a new level of intimacy with your aging parents. 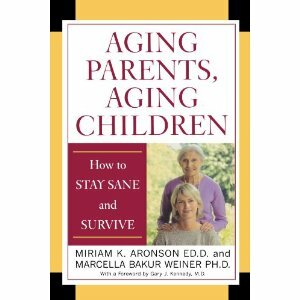 Book Review Aging Parents, Aging Children by Miriam K. Aronson ED.D and Marcella Bakur Weinger PH.D.
Drs. Miriam K. Aronoson and Marcella Bakur Weiner have written “Aging Parents, Aging Children” for the average person faced with a care-giving challenge. The book is filled with practical examples and dramatic scenarios to help the reader identify with others who have, or are experiencing, similar problems or challenges. Early chapters include helpful information pointing out diversity among families, differences in philosophy, beliefs, personality traits, and family dynamics. These all play a part in the approach chosen to provide the best possible care. As changes in physical health, emotional stability, or mental faculties, take their toll, it is important to begin an assessment process. This will help the family or caregiver size up the current condition through diagnosis, prognosis, treatment and aftercare needs. Excellent charts and tables provide an overview and checklist for this assessment and setting up a plan of care. Once this has been done immediate concerns, logistics, legal issues, and finances all come into play. I especially appreciated the chapter dedicated to discussing dementia and Alzheimer’s disease and the suggestions for placement versus home care. Symptoms, causes, and treatments are all considered in this informational and helpful presentation. A concern often overlooked is the care and welfare of the caregiver. This chapter is of particular importance to everyone reading the book. Self-care is an important part of the process of renewal, nurture, and balance. The final chapter titled “Demystifying the Maze” is a helpful glossary of important elder care language. Internationally acclaimed as experts in the area of elder care, Aronson and Weiner, collaborate to bring the reader insight, confidence, compassion and hope in caring for their loved one. The authors assist the reader faced with navigating the maze of systems and services, the challenge of relationships, resource limitations, and expectations of family and the importance of self-help. Well written in an easy to understand style. Thorough in presentation, written in an easy-to-understand style, “Aging Parents, Aging Children” is a practical prescription for an escalating pandemic of eldercare challenges. “Power to Change Your World” is aimed at helping the reader identify, recognize, and connect with the supernatural power of God. Throughout the book Danny McDaniel captures the simplicity of the Gospel message and the transformational power of the Holy Spirit available to the Christrian. Danny relates real life stories, Biblical examples, and personal life experiences to illustrate the commission given by Jesus to his disciples in Mark 16:15-18. He provides a ministry model with step by step guidelines and instructions to follow while collaborating with the Holy Spirit in miracle working power. Readers who are willing to put aside preconceived ideas to trust God for understanding, and who are willing to accept the truth of God’s Word at face value will benefit from the bold courageous teaching on the supernatural the power available to the Christian who is not limiting God. Gail Sheehy writes with a new depth and understanding on the theme of passages. Sheehy shares experiences from her own seventeen year journey in caregiving during her husband’s intermittent illnesses, after her he was diagnosed with cancer. “Passages in Caregiving” combines the elements of memoir, research, and stories or case studies from the lives of others to offer the reader practical guidelines and strategies for facing the challenge of turning the fear and chaos of caregiving into a confident experience. I was especially interested in her observations on guarding against repressed anger as a caregiver. I also received a much better understanding of causes for patient backlash and guidelines for taking proactive steps to avoid counter productive reactions. Her suggestions for drawing out memories, sharing family history, prompts for questions to draw out this information, and the importance of listening very helpful. The work is carefully researched, highly articulate, and filled with helpful resources, hotlines for caregivers, hospice programs, and information on the organization “Powerful Tools for Caregivers.” The material is all encompassing including debilitating diseases like: cancer, heart disease, stroke, lung disease, Alzheimer’s, Multiple Sclerosis, Parkinson’s, diabetes, Aids, and others. “Passages in Caregiving” is a book I plan to refer to often, pursue the suggested strategies, and recommend to others. Comprehensive, practical, relevant, and inspirational. A complimentary copy of this book was provided by the Amazon Vine program for review purposes. The opinions expressed are my own. While reading Christiane W. Griffin – Wehr’s book “Traveling in Place: A Journey into Memory Loss”  we were visiting a friend at the Sunbridge Health Care facility in San Leandro. Thelma’s friend had recently broken her ankle and was recuperating while anticipating therapy for her injury. Today was the third time within a ten day period I was sitting in the lobby of the facility while Thelma spent time with her friend. The lobby and front desk area was crowded with patients, their visitors, and a busy staff. Patients in walkers and wheelchairs longingly, edging toward the main door of the facility, were waiting for family members or perhaps an opportunity to escape. I was relaxed reading a book in an overstuffed chair nearby. I frequently glanced up to study my surroundings, noting the caring attention the health care workers gave to the wandering patients, often redirecting their attention and the direction of the path of their walkers. I smiled at nearby patients with my crooked half smile hoping I was coming across as sensitive and warm. Suddenly, I became very aware of my unshaven face as I realized that as well meaning visitors were coming and leaving they were giving me that same “hello, how are you greeting and smile” the patients were getting. Growing old gracefully is an art, and I am not an artist. The content of Wehr’s book, the confused state of many of the patients, and the stage of my own care giving experience made me very sensitive to the fragile balance and amazing capabilities of our minds. “God, You’ve Got Mail: 15 Keys to Abundant Provision” presents fifteen powerful principles described by Danette Crawford as secrets to abundant provision. Danette openly shares lessons she has learned through personal heartaches, spiritual battles, and victories won. The book includes a balance of carefully selected Bible verses offering admonitions, encouragement, hope, and promise. Biblical examples, testimonies and stories instruct the the reader in matters of obedience to God while internalizing these faith based keys to unlock His promises. Crawford included lessons in prudent fiscal management as well as the importance of recognizing God as your provider. These lessons are directed at providing helpful in these uncertain and challenging economic times. Other important lessons included: Cultivating an attitude of gratitude, acquiring new levels of faith, and the importance of develop a life style of prayer. Danette Joy Crawford’s writing conveys sincerity, empathy, humor, and the faith principles of which she writes. Articulate, convincing, practical encouragement and inspiration for followers of Christ in every circumstance. Kirkwood skillfully weaves a pattern of inspiration, information, and challenge through a practical progression of step by step instructions on how to strengthen and develop Godly imagination in a balanced Biblical way. He puts an emphasis on using the power of magnification and the power of love to see things through the eyes of God. Kirkwood maintains that everything in scripture revolves around God’s love as administered and imparted by the Holy Spirit. Using an emphasis on a focus on potential, graphic impressions, imaginative communication, Kerry describes the excitement which follows when we see our plans become reality, once we have dared to believe. These experiences testify to the creative ability we have to change our circumstances. Terry also explores the concepts of dreams as a tool for revealing images of destiny, the creative imagination of childhood, and the precise gift of prophecy using real life experiences and Biblical examples to illustrate the scriptural principles of the power of the imagination as the result of an overshadowing of the Holy Spirit. Kerry’s writing goes beyond theoretical, is validated scripturally, and evidenced experientially.